I think the price will put off a lot of possible buyers; however, in saying that, if you only buy one game this year, make it this one. Quite simply Ultima IV is the best role playing game I have seen for any computer. In terms of sheer size and playability, it is tremendous value for money. If you have a disk drive, go and buy a copy immediately. If you don't have a disk drive, go and sell something else and buy one. Then buy a copy of this amazing game. There is so much depth to Ultima IV that it is difficult to get all of it across in short review. If you have never had the inclination to try one, then there has never been a better incentive. There are a lot of games in this style for consoles, particularly in Japan. The Ultima series are the originals and the best. This is good enough to last you right through the Summer holidays and into Winter as well, by which time, hopefully, Lord British's minions will have finished work on Ultima V.
Ultima IV is a great challenge and it will take many months to complete. Vous aimez bien les jeux complexes et riches, et vous êtes un fan de Donjons et Dragons, n'hésitez pas, prenez votre plus belle épée et plongez dans le monde de Britania. Vous m'y trouverez sûrement. A part cela, Ultima IV est un jeu très intéressant, bien que difficile d'approche pour les plus jeunes d'entre vous, il satisfera tout de même tous les dingues de jeu de réflexion, de stratégie et d'aventure. Une dernière chose, ne séchez plus vos cours d'anglais, ils vous seront des plus utiles pour achever cette grande aventure mystique. I was expecting Ultima IV to be something of a let-down as a Sega title, but fortunately my fear have been well and truly quashed. Okay, the graphics and sound are a bit simplistic, but this doesn't distract from the strong story which grabs you by the throat and refuses to let go. Darauf haben Besitzer eines Sega Master Systems lange warten müssen: Das Rollenspielepos "Ultima IV" hat seinen Weg über die herkömmlichen Heimcomputer endlich in den Modulschacht der beliebten Sega-Konsole gemacht. Einzige weitere Kritik: Die Handhabung ohne Tasten ist ziemlich umständlich. Wollt Ihr Euch z.B. unterhalten, muß der Menüpunkt mit Joystick angewählt und jedes einzelne Kommando per Feuerknopf bestätigt werden. Hartgesottene Rollenspieler werden sich aber dadurch kaum die Freude am komplexen Spiel nehmen lassen. Drei Spielstände sind speicherbar, und Ihr könnt Euch auf eine l20seitige, komplett in Deutsch gehaltene Anleitung freuen. Sega-Besitzer, unbedingt anschauen! This NES port features updated graphics and music from the original version but retains its nonlinear gameplay, allowing players to proceed on their quest as they wish. A truly impressive RPG experience. Ultima IV je samozřejmě velmi rozsáhlé dobrodružství, jehož dohrání zabere několik desítek hodin. Grafické zpracování není dnes ani v kontextu freeware scény nikterak výjimečné, ale co také čekat od hry, která spatřila původně světlo světa v roce 1986? Je vlastně až zázrak, že běhá i na moderních systémech poměrně bez větších Ultima IV problémů (jen na Windows XP je většinou potřeba nasadit speciální program jako DOS Box) – a kdo by se ohlížel na technické provedení, když má před sebou jednu z největších klasik herní historie? Snažit se na omezeném prostoru recenze tady na Plných hrách popsat herní obsah Ultimy IV: Quest of the Avatar, neřkuli celý fenomén této slavné ságy, by bylo zhola nemožné, a tak raději uzavřu stručně: kdo už s Ultimou tu čest měl, ať se dále nezdržuje čtením tohoto textu (zdržoval-li se vůbec) a vesele stahuje, protože podobná příležitost se dlouho nemusí opakovat. Bei Ultima 4 handelt es sich ohne jeden Zweifel um lebendige Rollenspiel-Geschichte. Das Werk ist auch heute noch spielbar, jedoch sollte man jede Menge Zeit und Geduld mitbringen. Mir persönlich waren die Kämpfe am Ende, mit meiner vollzähligen Truppe, schon zu langatmig und zäh. Einige Rätsel sind ohne Tipps fast nur mit Glück zu schaffen. Trotzdem hatte ich viel Spaß, was vor allem an den ungewöhnlichen Schwerpunkten, der umfangreichen Welt und der tollen Steuerung lag. The is one of those classic game sequels that really packed a punch...and it was the 4th in the series! Even the box art was superior to most el-cheapo box art used today. Since this was made in the days when computer games came with freebies galore, U4 came with a free metal ankh, which was a symbol seen throughout the game itself; a cute added touch. There was also the typical artistic, cloth map of the world you could explore, as well as an elaborate manual. As for the game itself, this was the pivotal moment in the saga that put the hero of the game (ie, you) in the role of the Avatar; the symbol of everything good and virtuous in the world. If not the best in the series per se, it was still far ahead of the competition, in fantasy RPGs. Wer mal was anderes als "The Bard‘s Tale" auf seinem PC spielen will, sollte mal zu diesem Programm greifen. Aber Vorsicht: Es kann süchtig machen! Ano, jedná se opravdu o čtvrtý díl legendární Ultimy, který je mezi fanoušky ceněn mimořádně vysoko. Sierra vyšla vstříc a skvělé dílko Quest of the Avatar uvolnila jako klasickou freewarovku. Tak neváhejte a ponořte se do rozlehlého světa plného dobrodružství! In Quest of the Avatar, the rewards are high if you can endure the early going. While it can become painfully boring to get your party assembled and master the virtues, once the dungeon crawling begins, this game picks up and becomes fun and memorable as you stop piddling around with beggers and blood donations and start scrambling through mazes battling powerful monsters for great rewards. As a friendly piece of advice, if you want to get the most out of this game, don't even look at its instruction book. That 80-page monstrosity serves as a mini-walkthrough, giving hints (and, at times, answers) to many of the greatest puzzles AND is packaged with a world map that also gives you floor layouts for all but the final dungeon. When it's so rewarding to solve a game's mysteries (and let's face it, becoming a holy icon for the common man to follow is pretty damn cool), it just seems kind of lame to spoil that experience by having your hand held for most of the trip. Avatar is a worthy sequel to Exodus, and Ultima fans should enjoy it the most. Another massive quest with tons of items to find and mysteries to solve. 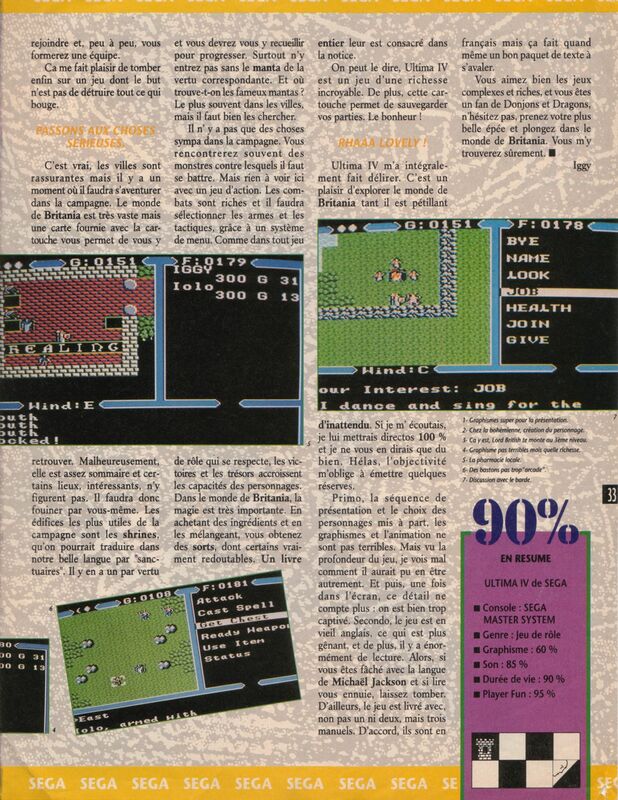 Not only is the quest bigger, but the graphics and sounds have improved greatly making Ultima 4 the best in NES RPGs. A fantasy quest like no other awaits you in Ultima: Quest of the Avatar, FCI's second NES installment of the famous role-playing game series. Quest of the Avatar comes closest to true role playing, in that every action by you character affects his destiny, including casual conversation with strangers. Prepare to enter one of the most detailed and challenging worlds in computer role playing, Britannia, as you begin the Quest of the Avatar! The animation and scrolling are poor, the graphics are flat, but the size and challenge of this game are what makes it work. This is an absorbing game with plenty of depth, that should please those who enjoy quest type adventures, and dedicated purists who are partial to straying occasionally from the orthodox text graphics adventure format. Overall though, Ultima IV is very playable, and has many secrets in store, waiting to be discovered! If the format appeals to you, then you won't be disappointed - it is the best of its genre I have come across. However, I'm pretty sure there is a very deep, involving and even rewardig game somewhere hidden in Ultima IV: Quest for the Avatar. I just don't think there are many games who have the patience to get it out. If any fault can be found in this incredible game, it would be in the fact that experience is gained only from combat, and in the later stages of the adventure, this tends to become a little tedious. Since the major theme of the game is the development of your character's virtues, it might have been a good idea to allow experience to be granted for accomplishing certain tasks, as well as vanquishing monsters, at least insofar as the major character (you) is concerned. Still, this is a relatively minor quibble, since there are ways to avoid excessive fighting with the moon gate spell, and the game design and execution overall simply dwarfs petty complaints. Grafisch und spielerisch fallen viele Ähnlichkeiten zu „Ultima III“ auf. Für knapp 200 Mark hätte man vielleicht etwas mehr inhaltliche Eigenständigkeit erwarten können, aber wer bereits vom „Ultima“-Virus infiziert ist, wird von den neuen spielerischen Details und der komplexeren Handlung begeistert sein. Es gibt neue Zaubersprüche, neue Charakter-Klassen und viele neue, herzallerliebste Monster, die in der Anleitung anschaulich beschrieben und illustriert sind. Außerdem haben sowohl Spieler als auch Monster die Möglichkeit, weinend eines Duells zu fliehen. Pur fortgeschrittene Rollenspieler ist mit „Ulima IV“ wahrlich das „ulimative“ Spiel. 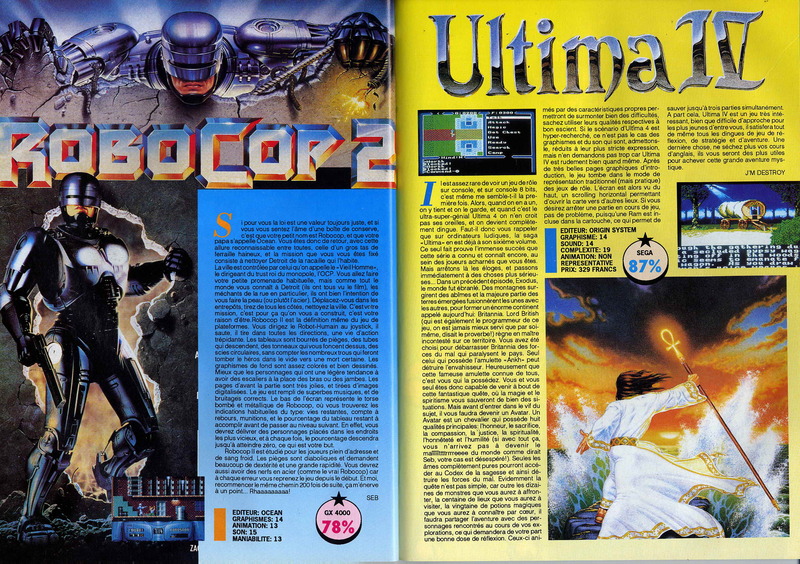 (…) Der derzeit beste Kauftip für Neulinge ist übrigens das gute alte „Ultima III“, das in der C 64-Diskettenversion bereits für 65 Mark erhältlich ist. Wer dieses Programm bereits besitzt und mit Begeisterung gespielt hat, kann ruhigen Gewissens den Sparstrumpf plündern, um sich auch den vierten Teil der Fantasy-Saga zu besorgen.